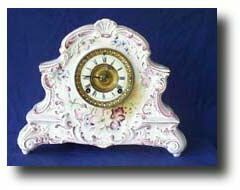 Ansonia China Clock , circa 1900 Case: Marked DRESDEN made Expressly for the American Wringer Co. New York . 11.5" tall. Works: Marked - Ansonia Clock Co. New York, USA. 8 day time and strike on gong. Condition: Case - Excellent except for oil stain on front left, no repairs no chips, no cracks. Works - Excellent.